Fry each tortilla, one at a time, in hot oil over medium heat until the tortillas are crispy. In a bowl, combine cinnamon and sugar. Sprinkle half of the cinnamon mixture on both the sides of the fried tortillas to coat them evenly. Even if all the sugar mixture does not stick to the tortillas, it is just fine. Combine the other half of the cinnamon sugar mixture with cornflake crumbs in a shallow bowl or plate. Make two balls with the ice cream scoops and roll them in the cornflake crumbs, till the entire surface is evenly coated. Roll the ice cream balls till no part of the ice cream is visible. Fry the ice cream balls in hot oil for 10 to 20 seconds, till the coat is golden brown in color. 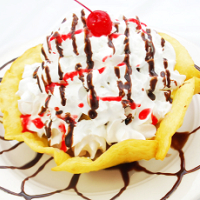 Now place the ice cream scoop at the center of the fried and coated tortilla. Spray whipped cream around the base of the ice cream and also on top of the ice cream. Garnish with cherry and serve. Note: If you do not have cornflakes to use in the fried ice cream recipe, you can also make use of any cereal you have. Bread crumbs can be used as well. The most important tip while making this ice cream is to make sure you coat the ice cream ball well, so that the ice cream does not come out of the coating and melt.